Goyenda-Peeth Lalbazar, 12 True Cases from Lalbazar Police Files. Bengali detective story book PDF. 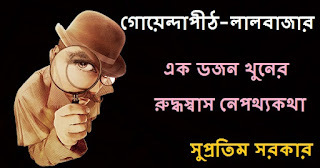 The detective department of Lalbazar (Calcutta) is compared with Scotland Yard in their efficiency to solve crimes. In the year 1868, Sir Stuart Hogg set up the detective department in Calcutta primarily to control the incidence of crime in the city and its detection. It is headed by a Deputy Commissioner of Police and assisted by Deputy Commissioner DD II.